1. Focus on the task at hand. Rest assured, any questions regarding any potential future opponent will be met with disapproval this week by those at One Patriot Place. Although the Patriots enter Saturday night's contest as historically heavy favorites, there is no doubt Bill Belichick will have his troops singing the praises of the Houston's top ranked (by yards allowed per game) defense. One need only to look back to the Texan's Wild Card tilt with Oakland this past Saturday to see what star edge defenders Jadeveon Clowney and Whitney Mercilus can do to an offensive game plan. 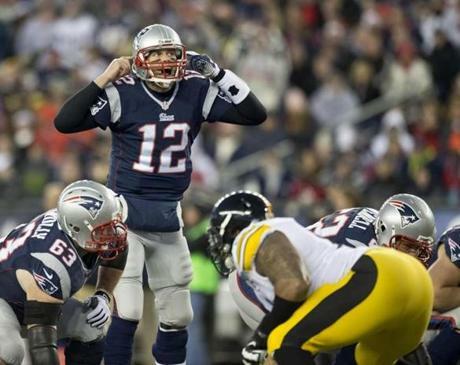 Pittsburgh's ticket to Foxborough is far from punched. They will have to travel to Kansas City's Arrowhead Stadium (ranking the loudest venues in the sport, only Seattle's CenturyLink Field rivals Arrowhead) for a rematch with the 12-4 Chiefs. Andy Reid's club has made significant strides since their 2-2 start, which was capped in week 4 by their 43-14 drubbing in Primetime at Heinz Field. The Chiefs reeled off 5 straight wins after their bye, and finished the season winning 10 of their last 12 en route to the AFC West Division title and a seat on their couches for Wild Card weekend. The Patriots are the only team in the NFL boasting a top ten ranking in passing yards per game (4th), rushing yards per game (7th), and 3rd down conversion percentage (4th). More than any other team football, they have the ability to pick and choose how they attack their opponents. This was evident in the week 7 victory over Pittsburgh. Without Ben Roethlisberger, the Patriots churned the clock with the LeGarrette Blount (Dion Lewis was still on the PUP list) to the tune of 124 yards and 2 TDs. Although the Steelers defense has improved since October, one has to wonder how much of a toll three straight high-energy playoff games in sub-freezing temperatures could take on the unit. Offensively, the "three B's" will get their share of chunk plays, but New England's balance will allow them to limit the unit's possessions and opportunities. 3. Thomas Edward Patrick Brady Jr. Son of Tom Sr. and Galynn, Tom Jr. is the winningest QB in NFL postseason history with 22 wins, including 2 against Pittsburgh (2001,2004). Primarily due to his NFL record 28-2 TD-INT ratio, he comes off of a regular season that yielded the third highest QB rating of his career. Brady enters his 15th postseason more rested than at any other time in his career due his 4-game suspension. On a weekend that saw his would-be counterpart Ben Roethlisberger appear in a post-game walking boot, Tom's biggest challenge was determining which social media entity to start a public account with. Fear not Patriots fans. Tom Brady is rested, angry, and verified.